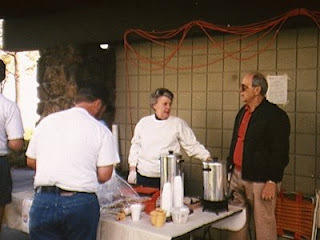 This picture was taken at the 1997 Conference in Fife, Washington. The person is not an EWGS member. Who is she?? The Bunny Slippers is a clue. The December 2008 E.W.G.S. General Meeting started with a quick business meeting and the election of officers for 2009: President Bill Hire, First Vice President Patricia Bayonne-Johnson, Second Vice President Pat Ewers, Third Vice President Carol Nettles, Corresponding Secretary Joan Martin, Past President Susan Beamer, Member at Large Lola McCreary, Trustees Pat Mielbrecht and Bev Vorpahl, and Recording Secretary Mabel Horrocks. The Treasurer's office is open due to the death of Gary Taylor. The new officers will be installed at the January meeting. During the month of November, Juanita McBride was accepting donations of books and publications to sell at the December meeting and E.W.G.S. members responded with a bunch of books and publications. There was a silent auction of some books, and the publications sold for a dollar a bundle. Everyone was issued a paddle with a number so you could bid on the books, and all the money was to go for a scanner to scan and back up books and materials in the library. The most fun was watching paddle #9 buy about half the books for sale, so you missed a great sale! ***** I would not recommend that you think to take both of these classes concurrently. The morning class is an entry-level class while the afternoon class is for the more comfortable researcher. Genealogy: Leaving A Legacy, Not A Mess, Class M215, March 20, Friday, 10:00 am to 12:00 noon, $9.00, CenterPlace. Genealogy: Where Is The Book With My Family In It?, Class M216, March 27th, Friday, 10:00 am to 12:00 noon, $9.00, CenterPlace. Genealogy: FamilySearch Indexing...Paying It Forward, Class M217, April 24, Friday, 10:00 am to 12:00 noon, $9.00, CenterPlace. Genealogy: 50 Ways To Document A Death, Class M218, May 1, Friday, 10:00 am to 12:00 noon, $9.00, CenterPlace. To register for any of these classes, call 279-6030 or register online at http://www.iel.spokane.edu/registration. Have you paid your dues for 2009? They are $25, payable to EWGS, and you can mail them to P.O. Box 1826, Spokane, WA 99210-1826. Don't forget to submit any address, phone number, or e-mail address changes with your dues, so that the corrections can be made in time for the 2009 directory. The January Luncheon is coming up soon. We will be meeting at noon at the Spokane Club (1002 W. Riverside Avenue) to hear Ian Chambers, Professor of History, University of Idaho speak on "Pirates of the Caribbean: Why Pirates Matter to History." For lunch, you have a choice of petite prime rib of beef, cedar planked king salmon, or pasta primavera (vegetarian). Cost is $26 for members; $28 for non-members. You must submit your reservation, check (payable to EWGS) and choice of meal to EWGS at the P.O. Box number above by December 30th, which with mail delivery time means you should mail this as soon as possible! For more information, see the green insert in the December issue of the Bulletin. One hundred years ago, Spokane was a rough and tough, shoot-'em-up Wild West town, where loggers, miners, and cowboys came to spend their hard-earned dough and enjoy a wild Saturday night in bars and brothels. What caused the city to change into a family-friendly, civic-minded community? Local historians credit Billy Sunday's crusade. Read the story here. "The staff of the Idaho State Historical Society, a number of intrepid volunteers, and members of the public from around the state have identified over one thousand Civil War veterans who lived or died in Idaho. These records are indexed alphabetically by surname, and whenever possible include dates of births and deaths, the states from which they served, and the Idaho counties where they resided. For many veterans, more than one record has been uncovered." 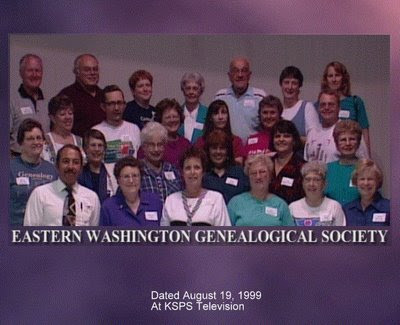 If you have ancestors from Eastern Washington, it may be that they lived at one time in Idaho. This is certainly a site worth checking. 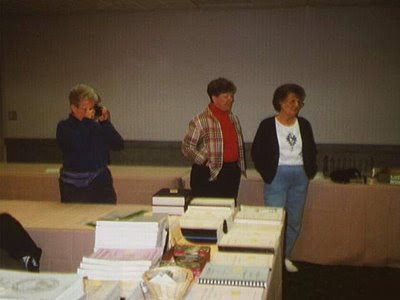 This Picture was taken at a conference I think that was in Fife, Washington 1997. For those of you who have taken my Find-A-Grave computer class (November 2006) or who have found this delightful site on your own, I wanted to let you know there is a great new feature available. I wrote a tutorial on it at my personal genealogy site here. Enjoy! That's the great thing about a Blue Bottle Tree....... it blooms even when covered with snow!! Those of you who have been to my garden in summer have seen my tree and now you see it in winter........ spectacular, isn't it? Also those of you who have been to my house know we have a 1/3 mile lane leading into the house and yesterday it was clogged with 24 inches of snow.......to my knees. Wow. What are the beautiful scenes in YOUR yard? The RootsMagic Users Group won't be meeting -- due to the weather and snow and cold and whatever.... I guess that needs no explaining. But hope to see everyone on Thursday, January 15th at 7pm at the LDS Church at 808 E. Sitka. Merry Christmas!! Also, the North Stake Family History Center will be closed for the rest of the week, due to the weather, and then closed the next two weeks for the holidays. This is likely true for other FHCs in the area. During inclement weather, it is always best to call before attempting to travel, since the Centers are volunteer-run, and safety of those volunteers is of utmost priority. Stay safe, everyone, and enjoy your holidays! EWGS members volunteer to help others. For a fascinating look back at some Spokane history, check out "The Great Depression in Spokane" on the Spokesman-Review Video Journal site here. The slideshow is composed of photographs of local events and sites, along with headlines from the depression-era Spokesman-Review, and is narrated by Jim Kershner. from left to right: Bill Hire, Charles Hansen, Bette Butcher Topp Photographed by John Ellingson, EWGS Historian. 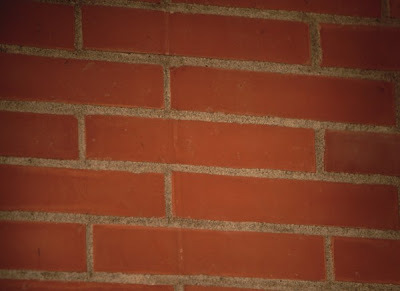 The November 1st meeting was a Brick Wall Panel of experts answering queries sent in by EWGS members. The panel of experts consisted of Barbara Brazington, Charles Hansen, Bill Hire and Bette Topp. We were introduced an moderated by Beverly Smith Vorpahl because our program chairman Pat Bayonne-Johnson was in the Caribbean on a genealogical cruse. Queries were due by October 15 and we received seven queries. Barbara was sick on November 1 and we really missed her. The first was looking for a death date an place for Jeannie Coe's grandfather. He was in the 1910 Washington census and disappeared before the 1920 census. I suggested trying the Idaho and Oregon Death indexes in the library, and also the possibility that he went to live with one or the other of his children and possibly died where the child lived. The next was a query from Inez Hodge on looking for the correct date of birth of an ancestor. She had a birth record and a death record that told his age in years, months and days and the two dates were not the same. I used the date calculator in PAF to come up with his date of birth from his death record, which was about six months earlier than his birth record, so was the death age wrong, could be since the birth information on a death certificate could be incorrect due to the informant not knowing. Inez came up afterwards and said if the death information date was correct he would have been born less than nine months after his parents were married, so they may have changed his birth record to show his birth nine months after the marriage. Joan Martin had a query about an Italian family in New York City between 1900 and 1910, and the panel was not much help on this query, Barbara did find a possible marriage for the lady Joan was looking for, but other than that we did not find much to help her. Gerry Gosche sent several queries, one on the Ship the Fortune that tradition says her ancestor left Ireland on in 1848, was shipwrecked and they went back to Ireland and got on another ship to America. She was not able to find a passenger record in New York and wondered if this story was true. The internet had several ships called the Fortune, but none of us could find anything about it being shipwrecked in 1848 or any other date. I checked the New York Times website and they had a review of a book where the people in the book had been shipwrecked in 1848 on leaving Ireland , came back to Ireland and eventually came to the USA. The panel suggested for Gerry to try alternate ports of entry, Boston, Philadelphia or even Canada. Gerry's next query was on looking for birth mother of a child of a serviceman and a lady in Taiwan in the 1960s. Bill had been in Taiwan as a serviceman and he suggested the American Embassy, and we suggested birth records, but with so little to go on that may never be solved. Gerry's next query was looking for a surveyor Thomas Gallagher that supposedly disappeared in the 1860s in “Indian territory”. While the government was surveying for a railroad about then and the area was starting to be settled it is possible he may never be found. I did have a suggestion on how I found my great-great grandfather was a surveyor, I checked the DAR books in the library on Washington Pioneers, and there was many pages listing my great great grandfather, and so I checked them. It was copies of deeds he had surveyed as the county surveyor in Missouri. So maybe the DAR had collected some information on her Thomas Gallagher. Gerry's last query was what happened to the Lockwood Studios and their old pictures? I checked the city directories and followed the Lockwood studios to the Valley, and through a name change to Cunningham Studios which is still operating here in Spokane. At the end the panel opened it up to queries from the audience, and also help from the audience. Hello, EWGS friends! Three of us, Cecily Kelly, Pat Bayonne-Johnson and me send you greetings from a whiteout-snowy Salt Lake City. The Family History Library is just as wonderful as ever and we've had a wonderful research week with the Salt Lake Christmas Tour. Best tip I've learned: click to the new FamilySearchWiki for all kinds of new help. Remember all the old Reference Guides and Resource Guides?? All of them were the foundation for the new wiki and information and links are being added daily to make this a "wunnerful" resource. Do check it out...and contribute. Currently, it's a work-in-progress and they ask help from all of us. But check out what is already there. We'll be back with you tomorrow; will see you all in 2009. If you are a RootsMagic user, or are simply curious about this genealogy software program, you may be interested in the RootsMagic Users Group, which meets at 7 PM on the third Thursday of each month at the LDS Church at 808 E. Sitka (this month's meeting is on December 18th). Lew and Trudy Lundy lead this group. For more information, e-mail them here. 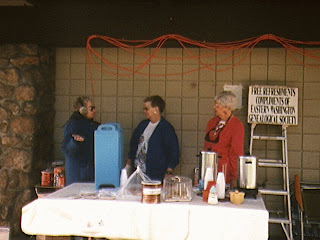 Another 1997 Photo of EWGS volunteers at the Rest Stop. The following records were added to the FamilySearch Record Search pilot. They can be searched for free at FamilySearch.org. Comments: Currently includes years from 1900 to 1920. Comments: Searchable digital images only. 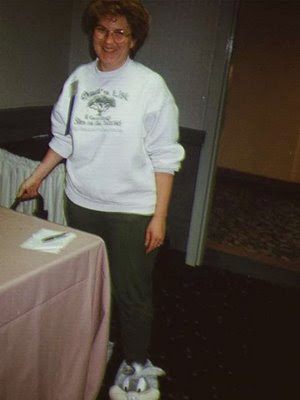 This photo was taken in 1997 at an EWGS fundraiser. The Genealogical Society of South Africa, West Gauteng Branch is considering a "Mentors for Members" program to boost and retain membership in their society. After discussing at length the decline of the branch membership in relation to the rise in national membership, one member suggested having a mentorship program, where an experienced researcher would be teamed with up to five "newbies", matched with similar interests or research locations. It's good to see a society brainstorming ideas instead of throwing in the towel when faced with decreasing membership. I applaud the West Gauteng Branch, not only for their efforts, but for sharing those ideas on their blog. Genealogical societies can learn from each other through the public forum of the Internet, such as a blog affords.